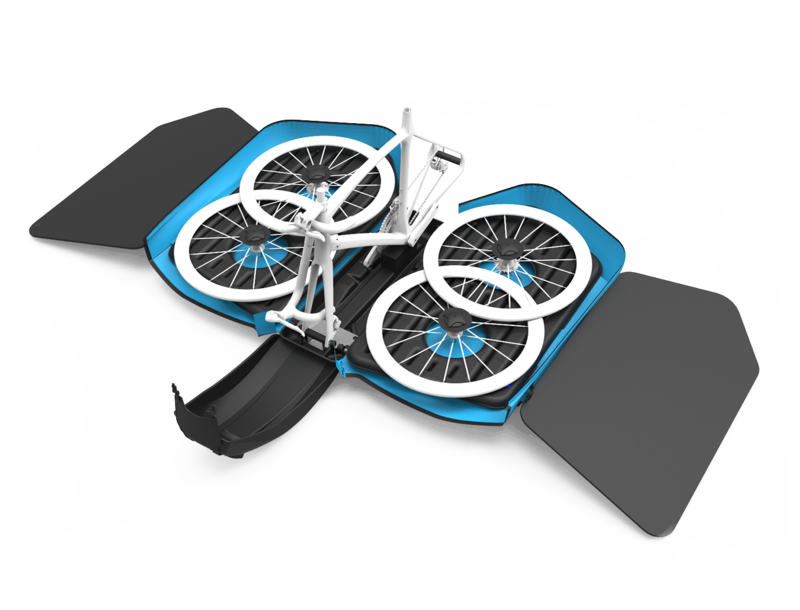 With progressive ideas, we developed a bike case offering superior function, simplicity and performance. 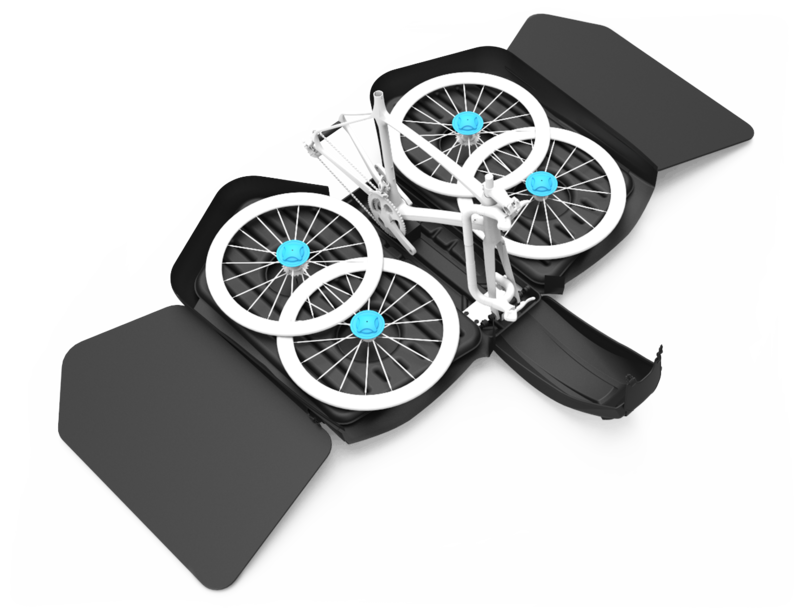 The Helium V4 bike case was created for globetrotters who travel with their bicycles on airplanes, trains or buses. Traveling with a bicycle has never been this simple: the Helium V4 is light and easy to carry and its revolutionary inflatable padding offers unrivaled protection. Thanks to its minimal dimensions, it fits easily in the trunk of even the smallest cars. 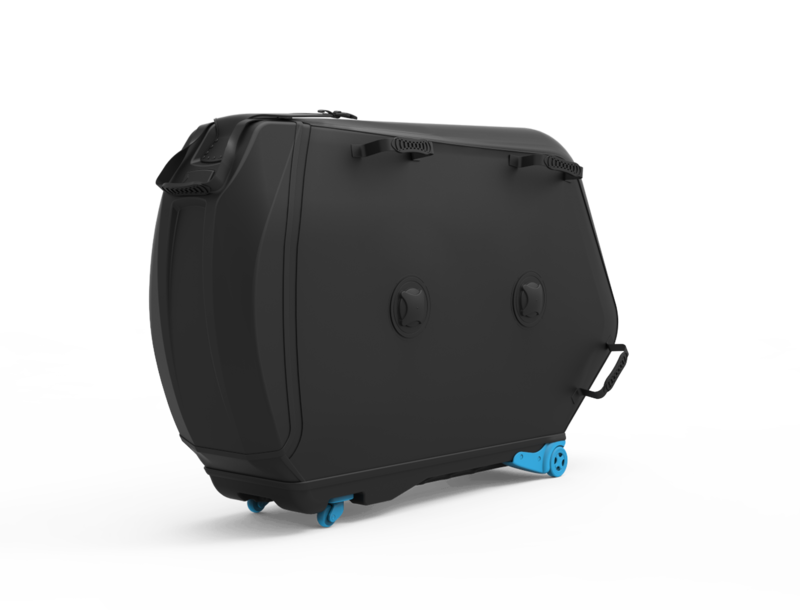 Every small detail has been looked into: the Helium V4 bike case has special compartments for an extra wheelset and also for stowing you helmet, shoes and other essentials (pump, spare tubes, etc.) 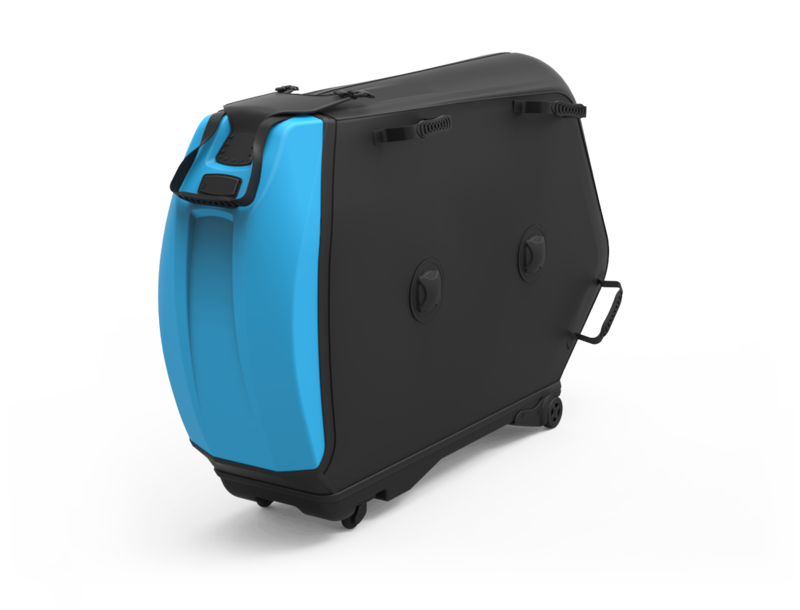 Developed with the input of pro cyclists, whose lives involve frequent air travel with bikes, The Helium V4 is simply the best bike case on the market today. The Helium case is light, offers unsurpassed protections against impacts and allows you to pack your bike with only minor disassembly and without changing the adjustment of its components. 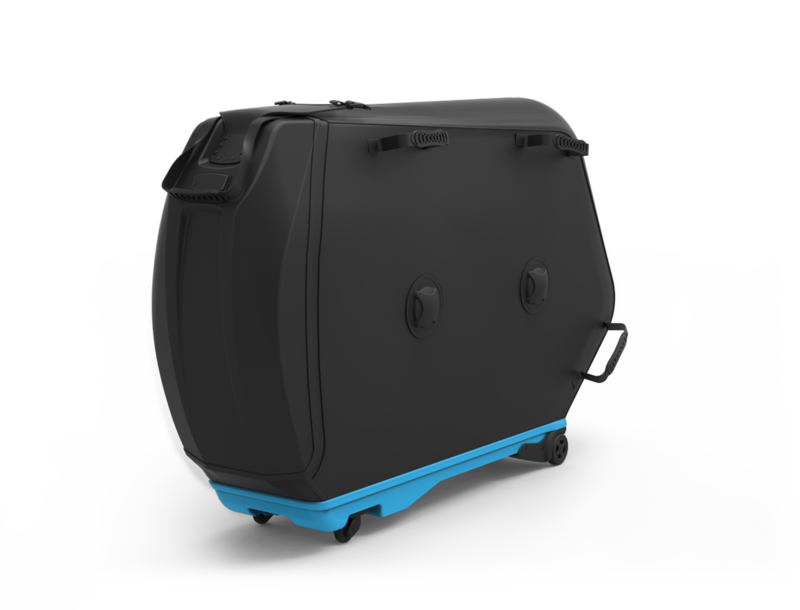 THE HELIUM V4 BIKE CASE uses a combination of light, flexible materials and strategically positioned rigid reinforcements, allowing it to offer excellent protection at a surprisingly low weight of only 9 kg (19.8 lbs). Not only is our bags easy on your shoulders, it also makes it easy to respect the strict baggage weight restrictions imposed by many airlines. 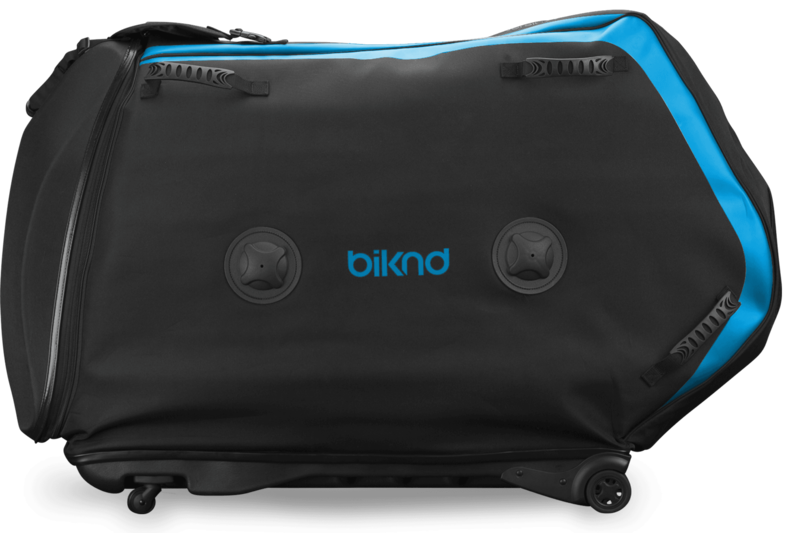 Being the only travel case in the market that has the ability to carry two wheelsets, our bags anchoring system guarantees top protection, ensuring that your bike is kept in the same condition in which you placed it in with not a single scratch on any part of the bicycle. The biggest innovation inside the Helium V4 is its network of inflatable partitions, strategically positioned on either side of the frame. They offer more stability and protection, at a lower weight, than other systems. The partitions are held in place by Velcro straps, making cleaning and maintenance a breeze. Lightweight, flexible, robust, easy to carry and handle, the Helium V4 possesses all the qualities that a traveler could dream of. Packing your bike has never been easier as the Helium V4 makes sure that you spend less time preparing your baggage and more time indulged in the adventure you seek. Complete Lateral Protection Once you’ve packed your bike and accessories, you simply fill the case’s inflatable protections. It’s as easy a pumping up a tire. A conveniently located opening on the side of the case allows easy access to the inflation valve. When you are all done and ready to go, simply throw the pump into the stowage compartment, conveniently located on the side of the case. The rigid shield is made of high molecular weight polyethylene (HMWPE). By design, they allow the bag, frame and wheels to act as one to protect fragile components. 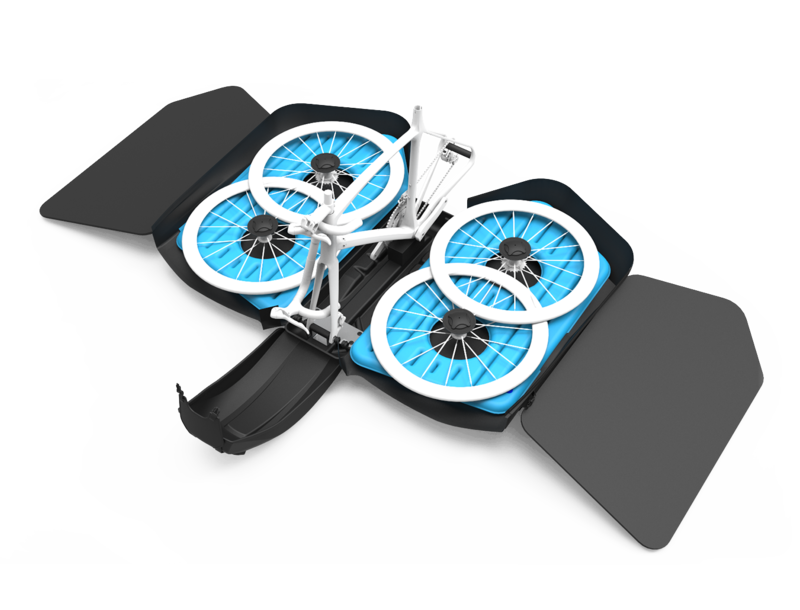 The Helium V4 was conceived to efficiently absorb and dissipate energy from the inevitable impacts of travel. The rigid base is made of high molecular weight polyethylene (HMWPE). By design, they allow the bag, frame and wheels to act as one to protect fragile components. 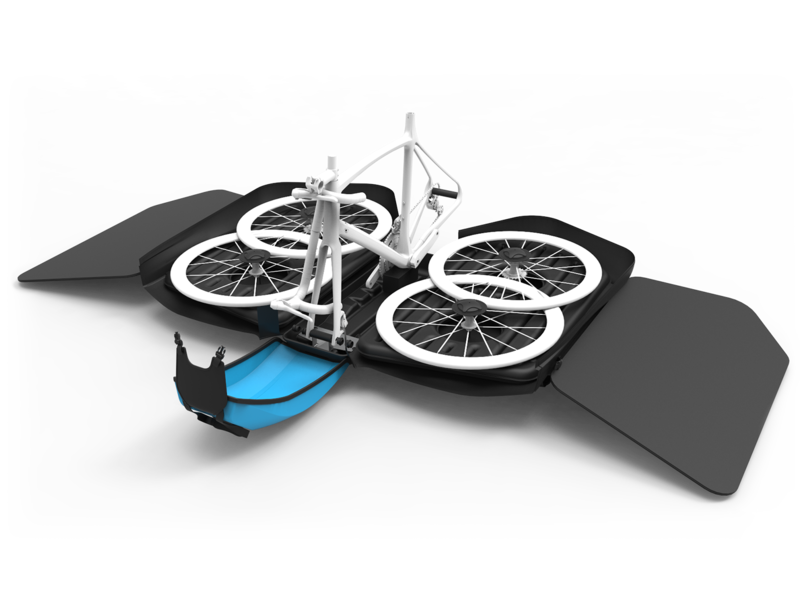 The Helium V4 was conceived to efficiently absorb and dissipate energy from the inevitable impacts of travel. The Helium V4 is also TSA approved which means that you will no longer have to worry about long check-ups at the airport while at the same time the case is also lockable. The Helium V4 comes with an adjustable front handle and additional 6 carry handles, 3 on each side, to maximize comfort and ease. Making it extremely easy to manipulate the case while you run for that late flight of yours. The “Hubcap Technology” prevents the wheels from any damage allowing it simply to absorb the vibration of a huge hit. The Helium V4 also provides its owners with the benefit of holding multiple accessories, limiting your baggage to a minimum. The case comes with an inner pocket for your biker gear and another external pocket for additional accessories. 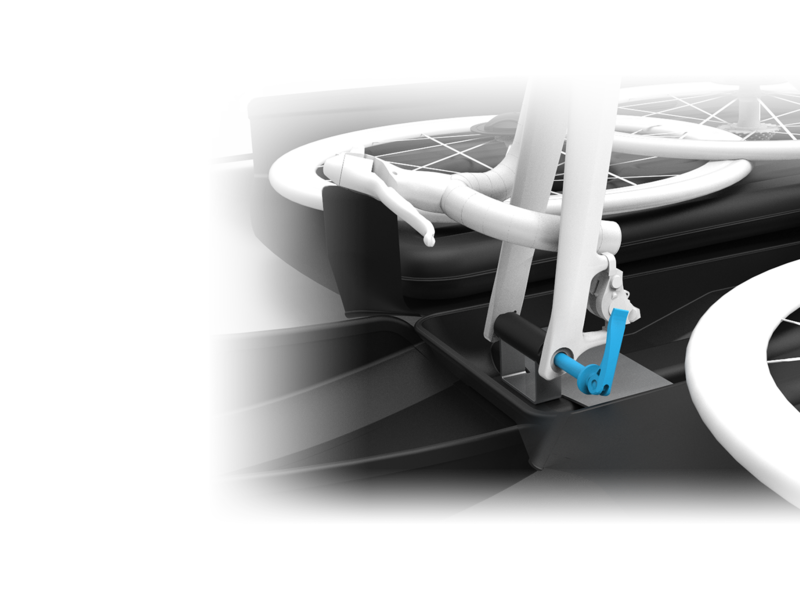 The case also will be convenient for owners of bikes with the thru axle system and quick release system, fitting them with ease. The innovative protective features of the BikND and the 360 degree access nose it ahead to take the overall win. With intergraded plastic sheeting on both exterior sides that is cut to enable extra protection against impacts, the top ¾ inch and plastic PE board provide the best front and rear protection. The rigid base is made of high molecular weight polyethylene (HMWPE). By design, it allows the bag, frame and wheels, to act as one to protect fragile components. 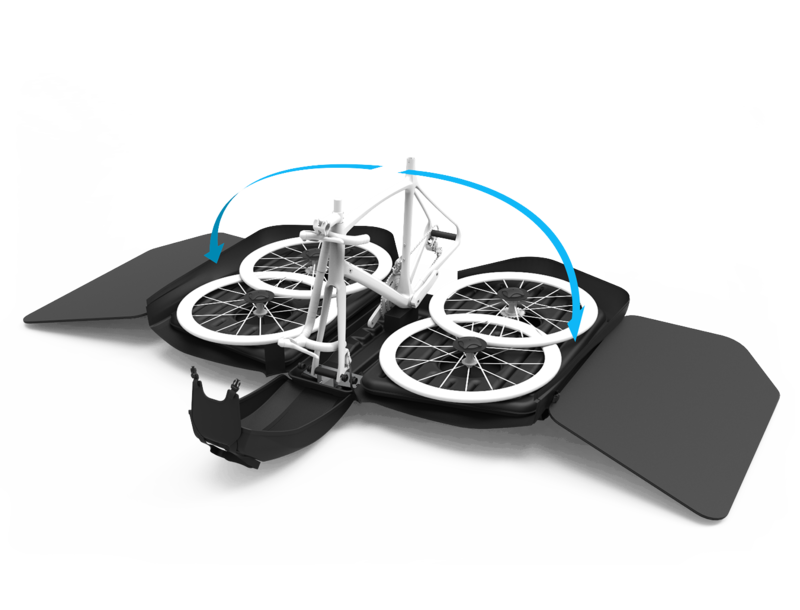 The Helium V4 was conceived to efficiently absorb and dissipate energy from the inevitable impacts of travel. The front base is made of high molecular weight polyethylene (HMWPE) that is not only designed to receive impacts and dissipate the energy, but also to protect fragile handlebar components whilst, while offering a useful storage area. Ease of access with opening on both sides that helps with foldability for a better storage. The lightweight aluminum tube, that makes the full length of the bag, combined with the adaptable wheel axle fastenings, allows you to attach the bike through the front and rear wheel axles to stabilise the bike during packing and transport. This case is designed to accommodate both thru-axle and standard quick-release. The adapter kit that comes with the case gives you the possibility to switch from one another really easily. Protection Robust, ultimate air protection. Lightweight 9 kg/19,8 lbs, 360º opening. Ready to fly Created for globetrotters who travel with their bicycle. Authorized by TSA. Flexible Folds easily for convenient storage. Road Compatible with a road bike. Packaging Suitable for 2 sets of wheels. Handling Equipped with 4 swivel wheels.